The schedule is posted here, every effort was made to accommodate ride time preferences, priority was given to creating homogeneous groups. Tik is a renowned tra iner that combines Eventing and Horsemanship. Tik believes in developing fundamentals at the most basic level to be successful as horses mature. Horses need to learn to walk, stand, catch, come, go, turn, ground-tie, mount easily, and get used to new things before they progress in their mounted training. Tik’s techniques do things such as help a spooky horse relax, or help a young horse get used to the leg for example. For those people who are more experienced, horse psychology helps them advance up the levels developing further understanding and better communication with their horses. Equestrian coach David O’Connor is a huge proponent of this technique. Tik has the support of the key influencers in the U.S and Canada and they are looking to him for innovative training methods. Semi private sessions for 60 minutes or groups of 3-4 for 90 minutes. Feel free to build your own groups! Private sessions by request only if space allows. Stabling: There are a limited number of stalls available to those staying over for the YEH competition the next day at the rate of $50. Please use the stabling form below to reserve a stall. 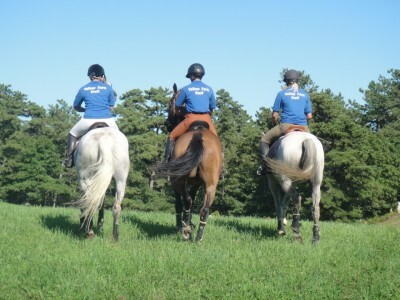 This clinic is a USEA activity, making it eligible for the Area1 Adult Rider voucher program. Join the Area 1 Adult Rider program and save $50!